(English) Regularly checks if a host is online and reponds to ping requests. Logs Online State and sends notification email if a host if offline. 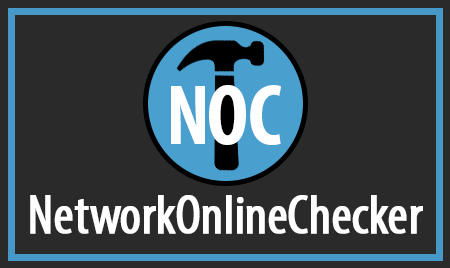 NOC regularly checks if a host is online and reponds to ping requests. 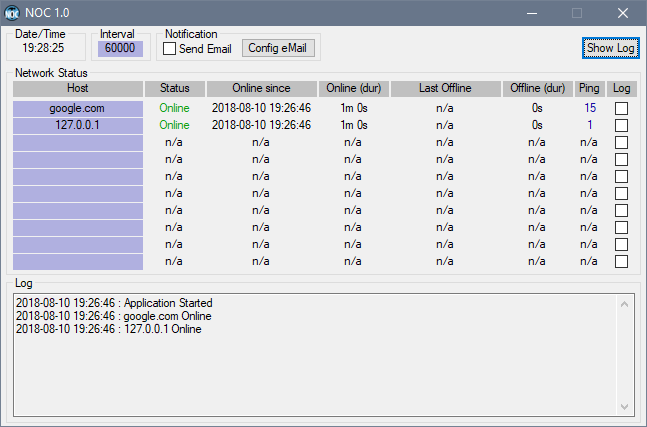 Logs online state of hosts and sends notification email if a host if offline. Regularly checks if a host is online and reponds to ping request. Sends EMail notification if a host is down and logs the ping times and offline time. Log files are stored in the „Logs“ folder in the application folder. Settings are stored in the file „Prefs.ini“ in the application folder. Stored EMail password for notification emails is protected with AES-256 encryption. NOC can be but anywhere without installation (just put it on a USB stick and start it). Up to 10 hosts can be defined either as host names or ip addresses. To enter a hostname just click on one of the blue fields. Online-Check interval Time can be set from 1 to over 40000 seconds. To change the interval time just click in the blue field with the title „Interval“. notifiction per email can be set and the intervall how often a email is sent if a host is offline. 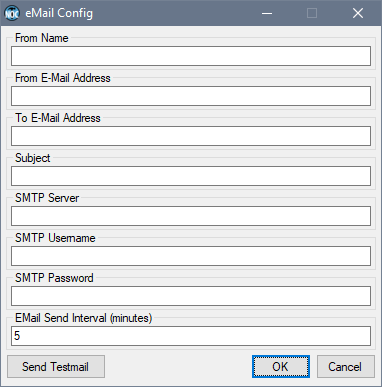 For EMail notification click on the „Config EMail“ Button to fill out email credentials. Keep an eye on your webserver, your Webshop, etc.